Millennium Recycling Filters are Not Recyclable. 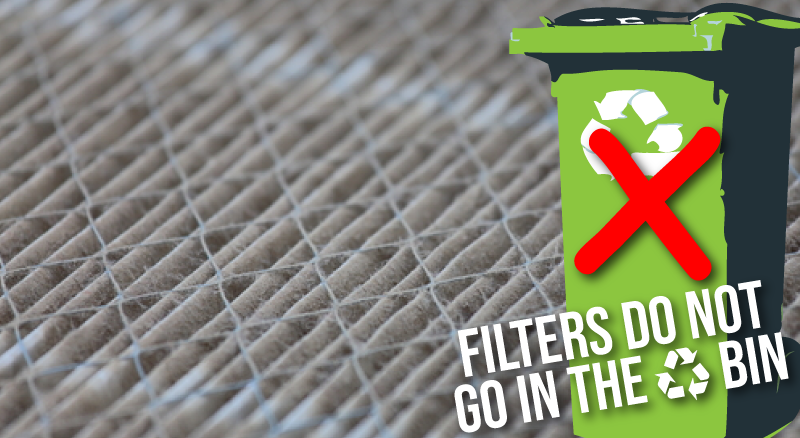 Filters are NOT recyclable in the recycling bin. Please keep them out. Furnace filters contaminate everything else and have to be manually pulled out by hand, which takes a lot of time, exposes our team to the collected filth and particles, and slows the process way down. Most disposable filters are made out of woven fibers including paper, polyester and fiberglass. Fiberglass is NOT recyclable, and when woven together with other materials it makes the entire filter non-recyclable. Also, handling dirty filters is a bad idea. They are full of dust and particles that we all want to get rid of in the first place! Proper disposal of old filters is important to prevent the collected irritants, allergens and other particles from becoming airborne again. Professionals recommend changing air filters at least every 3 months, so if following their advice, you’re dealing with dirty filters several times a year. With at least 90 days of trapped material in it, be careful very careful when handling a filter. The safest route is to carefully place it in the trash, cardboard frame intact. Carefully remove the old filter from your appliance. Place the filter in a plastic bag and tie or tape it shut to trap the contained particles. Immediately place it in your outside trash can. Reusable air filters may even perform slightly better than the cheap disposable filters. Bad part is they are about ten times as expensive and you have to wash them between uses. In the long run, they could save money by lasting for years, AND, of course, you’re saving the dozens of non-recyclable filters that would have ended up in the landfill. If you don’t mind washing them and are able to avoid exposure, reusable filters are your best bet to reduce your footprint. Note: Reusable filters need to be completely dry before they go back into your system to avoid mold or bacteria growth. Air filters, car filters, vacuum filters, paper filters, furnace filters, oil filters, coffee filters, pool filters, water filters, appliance filters, fridge filters, refrigerator filters, dryer filters, fuel filters, HVAC filters, duct filters are not recyclable. There are 0 comment. on "Filters are Not Recyclable."